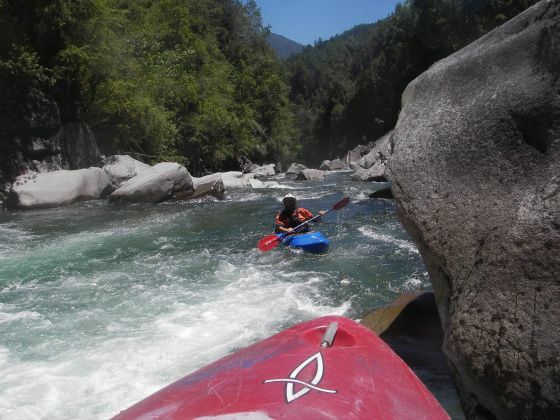 Flowing off the Southern flanks of Volcan Quetrupillan (2009 mters above sea level) and within a two hour drive of Pucon is the little known Rio Reyehueco. The river lies 21 km to the east of CoÃ±aripe on the road to LiquiÃ±e. It is strategically located midway between the Llancahue and Lizan Rivers. The river is runnable in spring and very early summer. The first descent was made in early december 2005 by Kurt Casey, Mike deacon and Beech Huntsman. Logistics were provided by Zach “delsapo” Cowan who had a blown out shoulder. The river is divided into two distinct sections. The upper is 3 km section dropping 153 meters. the upper has less volume than the lower but is also more channelized and more runnable at lower flows. To reach the put in take the road from east from CoÃ±aripe towards LiquiÃ±e appoximately 20 KM. If you reach the bridge over the Reyehueco you have gone to far and need to backtrack about 2 KM and look for a gravel road to the North with a sign for TrafÃºn. Follow the road 5 KM to a manned gate. This is the entrance to TrafÃºn which is a super cool ancient Mapuche community/logging complex. Zach gained us access by mentioning we were hydrologists doing research on the rivers. Once past the gate continue 4 km and you will pass over the Rio Panco which is a tributary of the Reyehueco. the road will come to an island of land between the two rivers and this is the takeout at 422 meters. To reach the put in continue upstream on either river left or river right (the raod makes a complete circle) until you come to a bridge over the upper Rio Reyehueco. Here the river is small in the 150 CFS (5 m/s volume) but more than sufficent for the mini canyons you enter below with small falls and significant boulder drops. the lower run has a totally different character and logistics. To run the lower return to main road and go to bridge over the Reyehueco. This is the takeout at 170 km above sea level. The run is 5 KM long and drops 230 meters for average gradient of 37 m/km (185 FPM). The put in is at 400 meters above sea level. To reach the put in continue east 1 KM and make first left. the road will climb steeply for a few km’s then you will need to find a turn to the left. This raods can be a bit confusing due to logging that has messed up the roads. Follow the road until you reahc a school in Mapuche village of TrafÃºn.chico. We parked at the school and walked the 300 meters to the river (the road had been washed out recently by a flood). The put in for the river is very entle water with a paltry flow of 300 CFS. This was marginal water for the first KM but in the crux proved to be perfect. there are numerous BIG drops on the run but the crux occurs right before the canyon opens near the takeout. At this point the river is diverted into an aqueduct that feeds a fish hatchery. 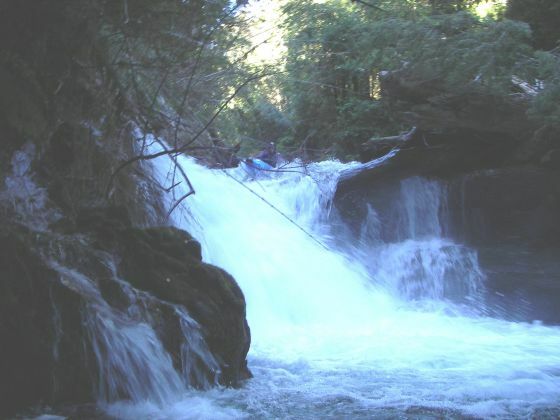 It appears a portage is impossible and the drop is burly and very hard to scout. We felt trapped but eventually ran (partially blind) a 15 plus foot (5 meter) falls with a left to right angle. 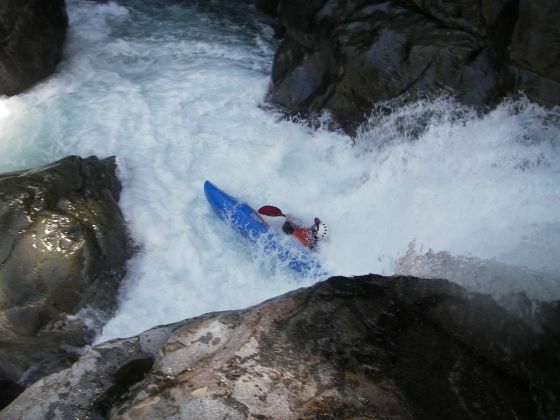 The drop was clean and finished the run with another 300 km paddle in boogie water to the takeout bridge.